Surf Camp is Open for 2019! 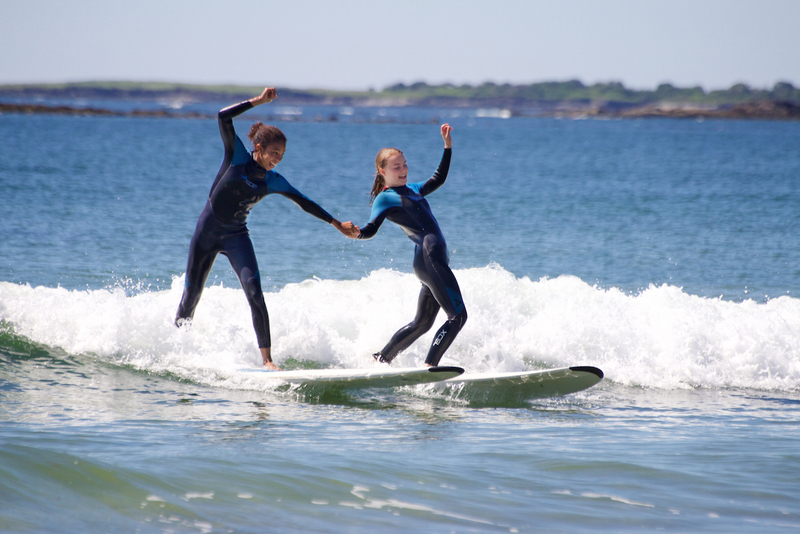 In recent years, our offerings have grown so that we now truly have something to interest anyone who loves the ocean and the outdoors, from our namesake summer camp to our adult surfing program, which will be entering its 6th season. As you know, our programs fill up fast, so take a look at your calendar and get your booking in ASAP to guarantee the availability of your preferred dates. See you soon enough on the beach! Our flagship summer camp program for kids and teens ages 9 to 15. Weeklong sessions, Monday through Friday, 9am – 3pm all summer long. This will be our 17th season of Surf Camp! 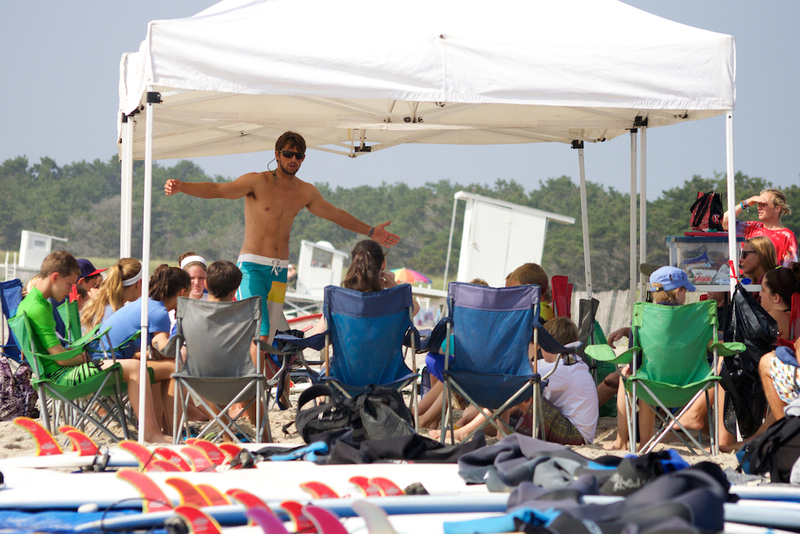 Adult Surf Camp is the best way to learn to surf if you’re no longer a kid or a teen. Our 4-day evening program is the only offering of its kind, designed specifically to provide adults with the foundation they need to become competent surfers. Ages 21 and up, sessions run Monday – Thursday from 5:30 – 7:30pm. 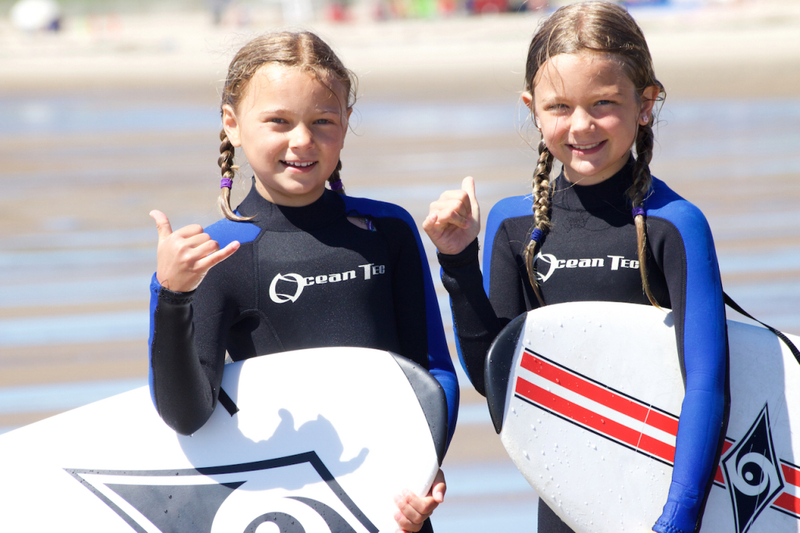 If you’re not ready to commit to a multi-day program or you want to get the whole family in the water together, taking a Surf Lesson is a perfect summer activity! P.S. We can accommodate groups of up to 20 people for events and private lessons, so don’t hesitate to give us a call if you want to plan an amazing experience for a big group! Surf + Climb Camp unfolds over selected weekends in small groups and combines a morning of surfing, lunch at the beach, and climbing in the afternoon up the road at Salt Pump. Tons of fun and no one gets bored! Ages 9 to 17. 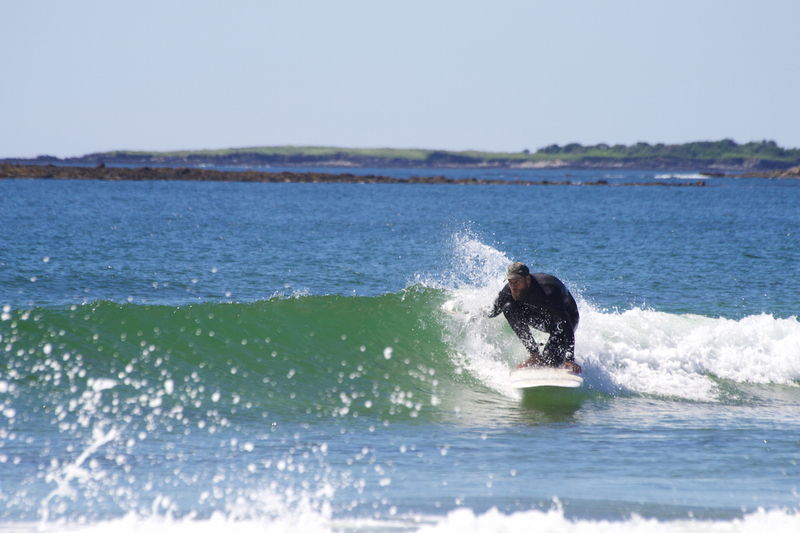 This month long program runs in the month of September and is designed to help more advanced surf campers take the next step in advancing their skills in New England’s fall surf season, when chances for bigger waves and ideal conditions abound. Don’t hesitate to call or email with your questions or for help signing up for one of our programs. Thanks as always and I look forward to seeing you on the beach and in the water! 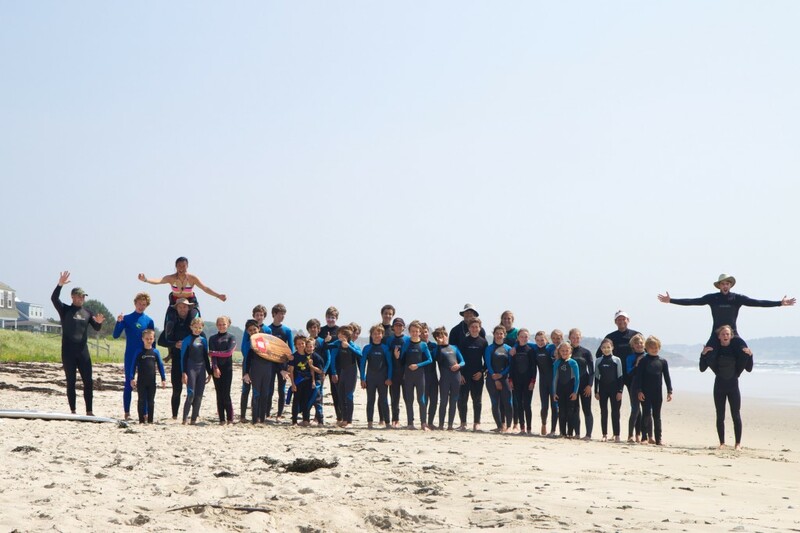 This entry was posted on Friday, January 18th, 2019 at 11:07 am and is filed under Adult Surf Camp, News, Surf Camp (Day Camp). You can follow any responses to this entry through the RSS 2.0 feed. Both comments and pings are currently closed. 2017 is here and we are off and running planning another summer full of programs for kids, teens, and adults of all ages! Enrollment for most programs begins on January 15th. Day camp for kids and teens aged 9 to 15. Weekdays 9am-3pm. $469 per week. 4-day evening program for adults aged 21+. Mon – Thu, 5:30-7:30pm. $375 per week. 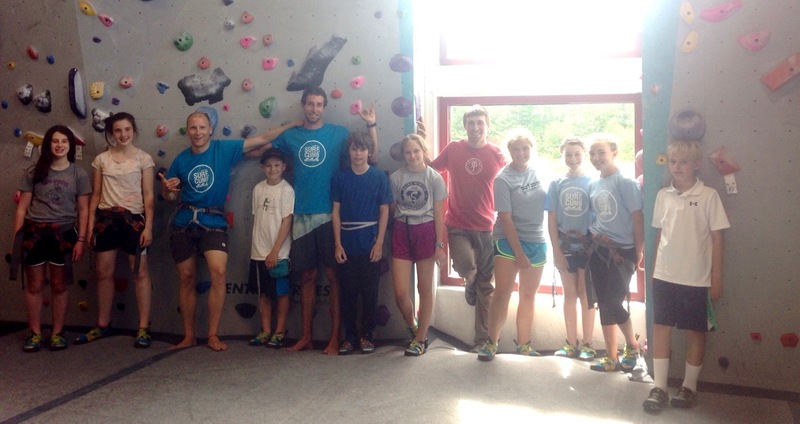 Weekend day camp for kids & teens aged 9 to 17. Saturday/Sunday, 9am-3pm. $219/pp. 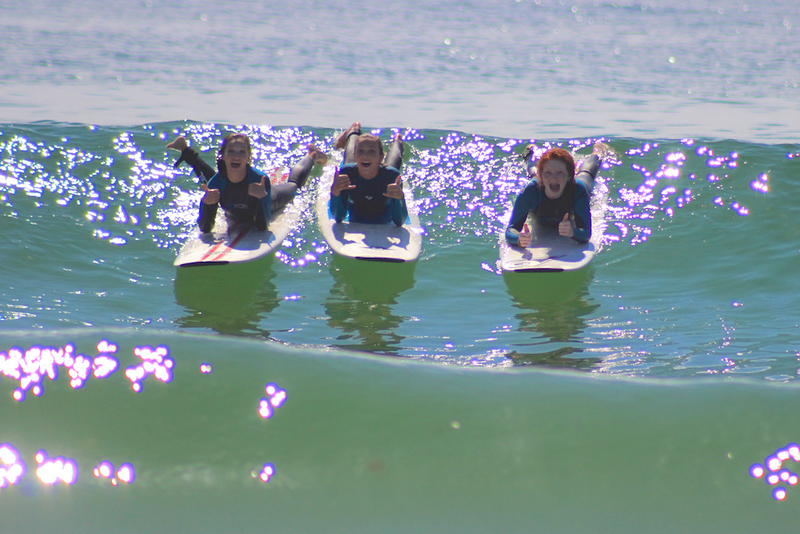 We will of course also be offering both group and private surf lessons for kids and adults of all ages (9 and up). We offer half-day group surf lessons every Saturday morning from 9am to noon at Scarborough Beach, in addition to offering private and semi-private lessons Tuesday – Friday mornings starting in July. These are booked through our website and will become available for reservations starting in February. This entry was posted on Tuesday, January 10th, 2017 at 1:58 am and is filed under News, Surf Camp (Day Camp), Uncategorized. You can follow any responses to this entry through the RSS 2.0 feed. Both comments and pings are currently closed. For the 2016 summer camp season, I’m excited to announce a collaborative weekend offering in conjunction with Salt Pump Climbing in Scarborough. Salt Pump opened their new facility in the fall and the idea was hatched when I started climbing as an alternative to flat surf days. Being new to climbing, I found the challenge of climbing stimulating, and with many of Salt Pump’s staff also being surfers, it became clear that the symbiosis between surfing and climbing is strong. Both surfing and climbing emphasize a relationship with our environment, and while each activity is usually enjoyed with other people, both are essentially individual pursuits that illicit total focus and presence of being. There’s also a healthy physicality to both surfing and climbing that requires mind and body be in tune with one another in order to succeed and progress. As a result, I’m happy to introduce a series of Surf + Climb Camps that will take place over the weekends: these Saturday/Sunday programs will run from 9am to 3pm, starting out at Scarborough Beach to take full advantage of light morning winds (good for the surf) and then heading over to Salt Pump after lunch to climb. The program is designed to accommodate surfers and climbers of all levels. 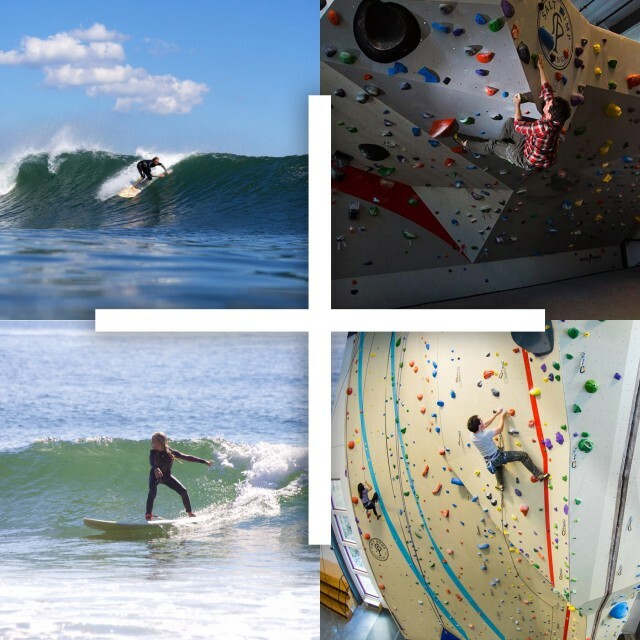 In the ocean, participants will learn from our team of experienced surf instructors and at the climbing facility, we will all learn (myself included) from the equally experienced climbers at Salt Pump. It’s going to be a ton of fun and I hope you’ll join us! This entry was posted on Saturday, January 23rd, 2016 at 5:47 am and is filed under News, Special Programs, Surf Camp (Day Camp). You can follow any responses to this entry through the RSS 2.0 feed. Responses are currently closed, but you can trackback from your own site. The last week of camp for the summer of 2015 did not disappoint. Beautiful weather and fun sized, glassy little walls were fun for everyone. And as the photos show, these guys are RIPPING! Check out Pearl (first photo), Anya (third photo), and Nic (fifth photo) — killing it! What a great way to cap off the summer. This entry was posted on Monday, August 31st, 2015 at 11:06 am and is filed under Camp Photos, Surf Camp (Day Camp). You can follow any responses to this entry through the RSS 2.0 feed. Responses are currently closed, but you can trackback from your own site. 2015 Season Leads Off With WAVES! The 2015 season launched full speed ahead last week with waves aplenty. The first week of camp saw good waves and beautiful conditions, with lots of opportunities to challenge and exhilarate everyone. Day #1 of the season brought clean stomach high surf that delivered consistent waves through the end of the week. And we couldn’t even believe it when Monday of week #2 brought even better waves that lasted right up until Friday afternoon. Thanks everyone for an awesome kickoff to the season! This entry was posted on Sunday, July 5th, 2015 at 9:15 pm and is filed under Camp Photos, Surf Camp (Day Camp). You can follow any responses to this entry through the RSS 2.0 feed. Responses are currently closed, but you can trackback from your own site. As we welcome the new year, it’s already time to start thinking about your summer plans. We have finalized our 2015 Surf Camp dates (below) and remind everyone that we start accepting sign ups on January 15th! Starting on that date, you can sign up here: Surf Camp Online Application. We can’t wait to be back here! This entry was posted on Friday, January 2nd, 2015 at 3:24 am and is filed under News, Surf Camp (Day Camp). You can follow any responses to this entry through the RSS 2.0 feed. Responses are currently closed, but you can trackback from your own site. Above: This surf camper was sure he’d spotted buried treasure. He just missed it on the dive! Below: Group photo with Prout’s Neck in the background. This entry was posted on Friday, August 8th, 2014 at 9:20 am and is filed under Camp Photos, Surf Camp (Day Camp). You can follow any responses to this entry through the RSS 2.0 feed. Responses are currently closed, but you can trackback from your own site. The waves for weeks #3 and #4 of Surf Camp provided non-stop fun. We had light winds and sunny skies to make the small but consistent pulse of swell a perfect mid-summer treat. There wasn’t much time spent out of the water in either week. Above: Can you beat this? 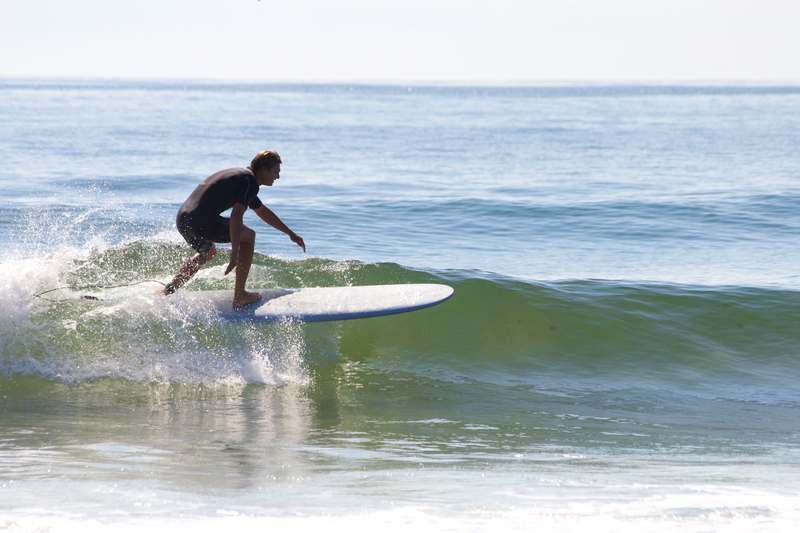 Warm water, sunny skies, glassy waves = GOOD TIMES! 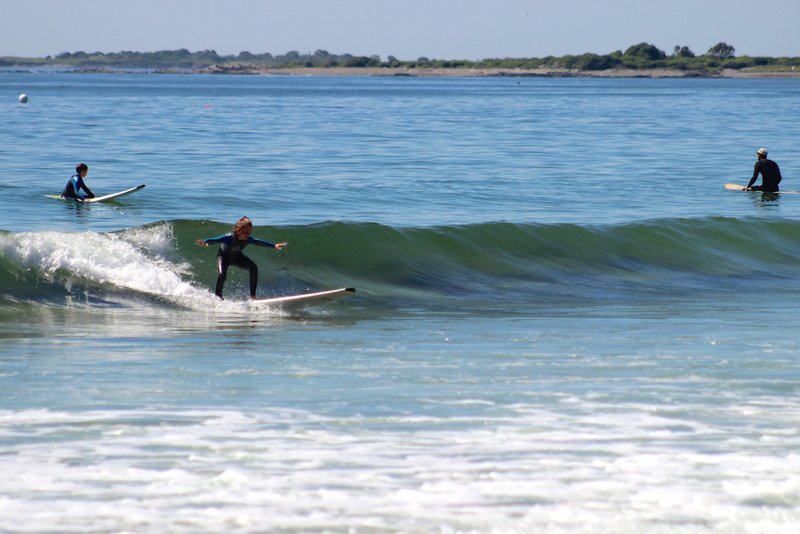 Below: Surf instructor Sawyer Theriault cruising the nose on a nice little runner. Above: When it comes to learning to surf, waves like this are pretty much perfect. Below: Instructor Emily Heath navigating some fun lines at Scarborough Beach. This entry was posted on Sunday, July 20th, 2014 at 4:16 pm and is filed under Camp Photos, Surf Camp (Day Camp). You can follow any responses to this entry through the RSS 2.0 feed. Responses are currently closed, but you can trackback from your own site. The second week of Surf Camp did not disappoint… so far this has been an above average summer for waves and weather, and the kids are loving it! So are we… images link to full gallery and downloads. This entry was posted on Sunday, July 13th, 2014 at 3:19 pm and is filed under Camp Photos, Surf Camp (Day Camp). You can follow any responses to this entry through the RSS 2.0 feed. Responses are currently closed, but you can trackback from your own site. This picture says it all: two thumbs up! 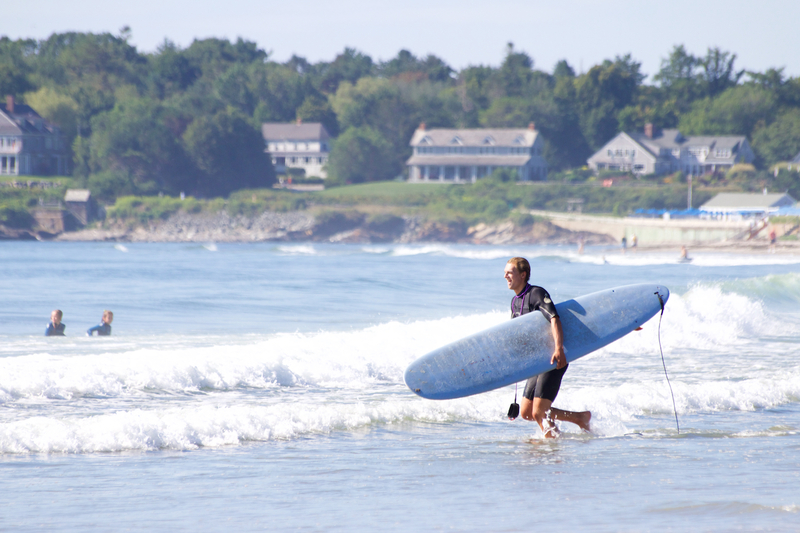 Can’t believe how fast the summer is flying by as we sign off on another beautiful week in 2013, filled with warm water and fun waves. Enjoy the photos! This entry was posted on Saturday, August 3rd, 2013 at 10:00 am and is filed under Camp Photos, Surf Camp (Day Camp). You can follow any responses to this entry through the RSS 2.0 feed. Responses are currently closed, but you can trackback from your own site.